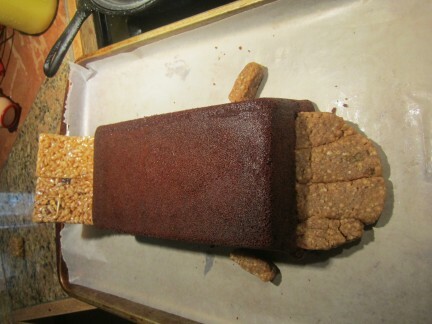 Every year, for my kids birthdays, I make their cake… whatever kind of cake they want. I’ve made unicorn heads, construction sites, Ariel the mermaid sitting on an island floating in the water, and more mermaids….. you name it. It’s always a fun challenge. 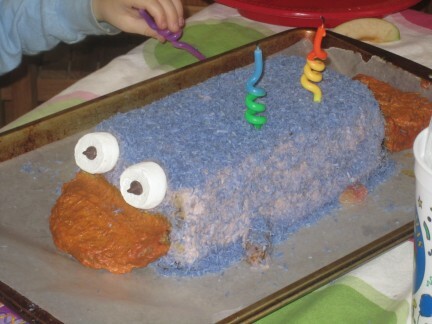 But, this year when Leif requested a Perry the Platypus cake I was stumped. 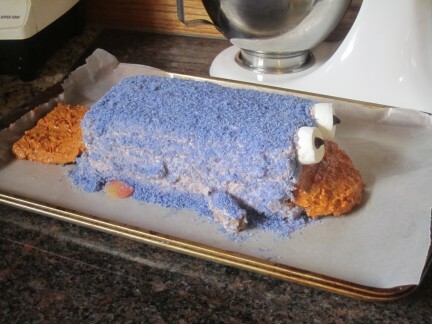 How was I to recreate a little platypus with aqua blue fur without using artificial food coloring? 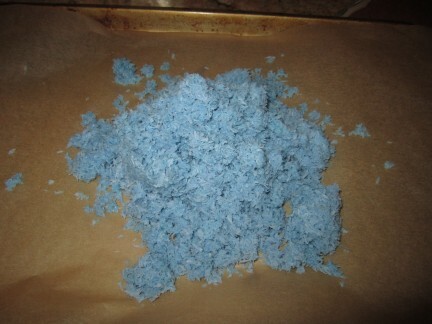 There is just no good natural blue. Cabbage can be boiled down, but that ends up being more pale blue/grey. Blueberries are actually purple. 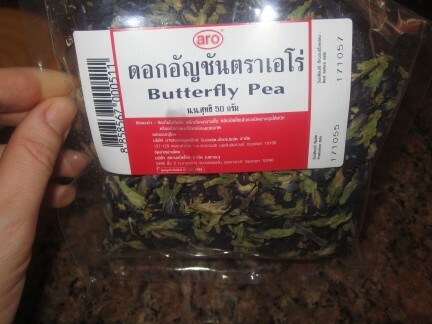 Then I found these: Butterfly Pea Flowers. They grow on vines native to Southeast Asia and are known for their vibrant blue color. When steeped in hot water, they color the water a beautiful blue… the perfect blue for Perry the Platypus. My hope was that the flowers could be infused in oil, too. Then I could infuse some coconut oil and use the oil in the frosting. But, no such luck. The color didn’t transfer to the oil at all. I heated them in coconut milk and got a light blue, but not the striking blue I was looking for. Butterfly Pea Flowers infused in coconut milk. 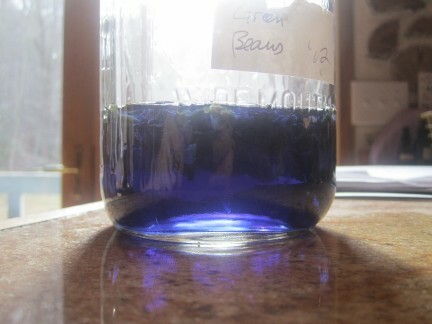 Butterfly Pea Flowers infused in Rum…. just for the hell of it! 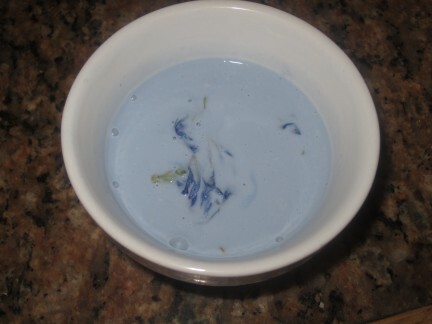 Butterfly Pea Flowers infused in boiling water. 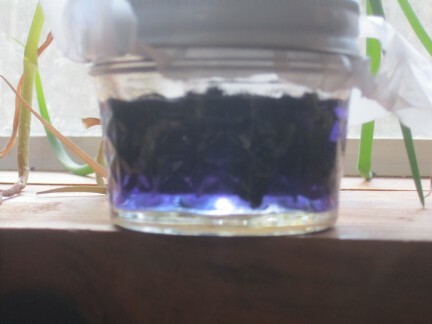 So, I decided to infuse them in water, making a very dark blue with lots of flowers. I put this blue water over about 6 cups of coconut. I used enough water to coat the coconut, but not drown it. Then dried the coconut in the oven at 130 degrees stirring it every 30 minutes. I think it took about 3 1/2 hours to dry out completely. And while I was soaking things in this lovely blue water, I decided to throw some hard boiled eggs in there. 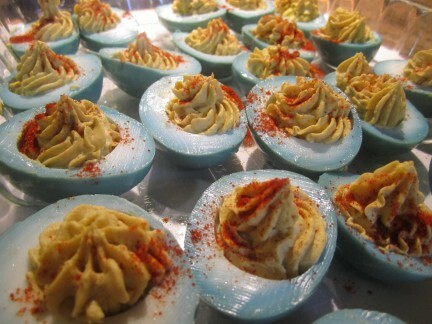 I soaked these for 2 days before the birthday party so that I could make some blue deviled eggs! 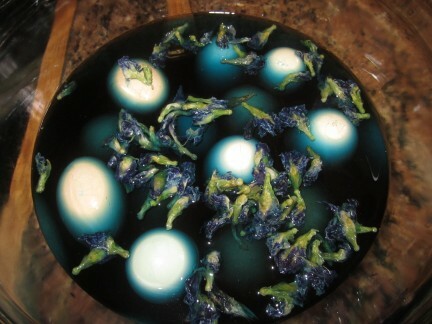 Eggs in Butterfly Pea Flower water. 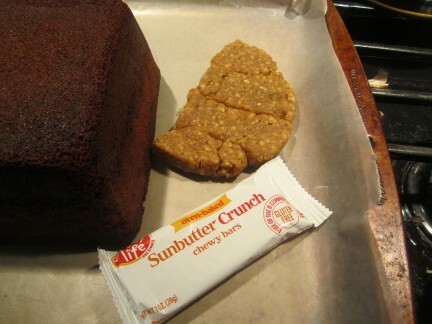 I smushed together some Sunbutter Crunch bars to form a bill. Here’s the pre-frosting set up. The front limbs were also made from Sunbutter bars and the feet from peach gummy candies. And here’s Perry. I put some of the coconut in the frosting as well as coating the whole cake with it after it was frosted. It’s certainly not as blue as the real Perry, but I think it turned out pretty dang good! Leif was thoroughly satisfied with his cake! Oh, and with his blue eggs! 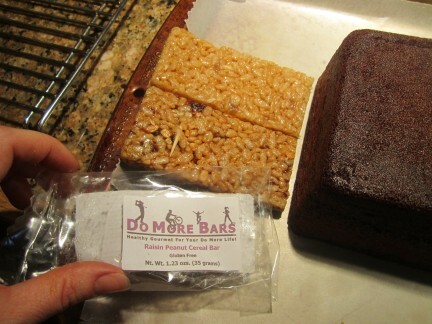 This entry was posted in Do It Yourself, General, Mothering. You are very creative and I love your adventure in the kitchen as well. Your birthday cake dedication is the stuff of legends. Wow, Maria! I am so impressed with your creativity and motivation to help your kids have their best birthdays ever, year after year. You rock. 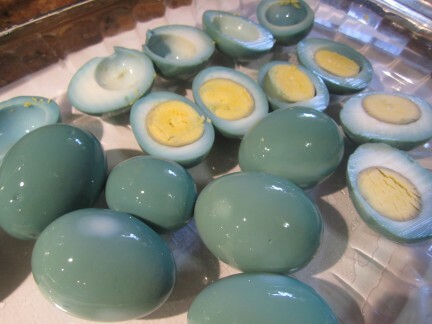 Cool experiment, and those eggs are gorgeous! Awesome! You pulled it off very, very well. Your ingenuity never ceases to amaze me! And on another note, we were sorry to hear about Max.